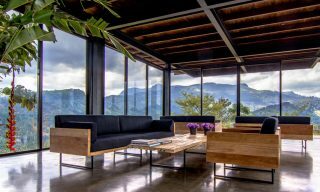 A luxurious new resort provides the perfect excuse for exploring this bucolic corner of Sri Lanka’s southern coast. It’s three days until the Sinhala New Year and downtown Tangalle is bustling in anticipation. Loudspeakers pump out pop music and sales promotions, villagers hawk rustic clay pots and braziers on the sidewalks, and the morning vegetable market is in full swing, its tables groaning under a bounty of fresh produce. I’m here with an affable young chef from the nearby Anantara Peace Haven resort to pick up some vegetables for the curries he is going to teach me how to make, but unlike the swirl of sari-clad shoppers around me, I have no idea what I’m looking for. “Anything, anything you like,” he tells me. “You can put anything into a Sri Lankan curry and it will be delicious.” Ten minutes later I climb back into one of the Anantara’s shiny new electric tuk-tuks for the return drive to the resort, a modest haul of okra, green beans, bitter gourd, eggplant, and bright-red tomatoes on the seat beside me. The curries we make during the “Spice Spoons” cooking class that morning are, as promised, delicious. I can take no credit for this. Though I do a bit of chopping and grating, most of my time is spent thoughtfully sipping a glass of chilled Prosecco as the chef explains and executes the preparation of five different curry dishes (one involving the plump tiger prawns we acquired on an earlier foray to Tangalle’s fishing pier) and a dynamite coconut sambol. And since I’m his sole student, the resultant feast is mine alone to devour. So I stuff myself—and spend the rest of the afternoon lying in torpor next to my villa’s pool like an engorged python. But my appetite for this corner of Sri Lanka has only just been whetted. 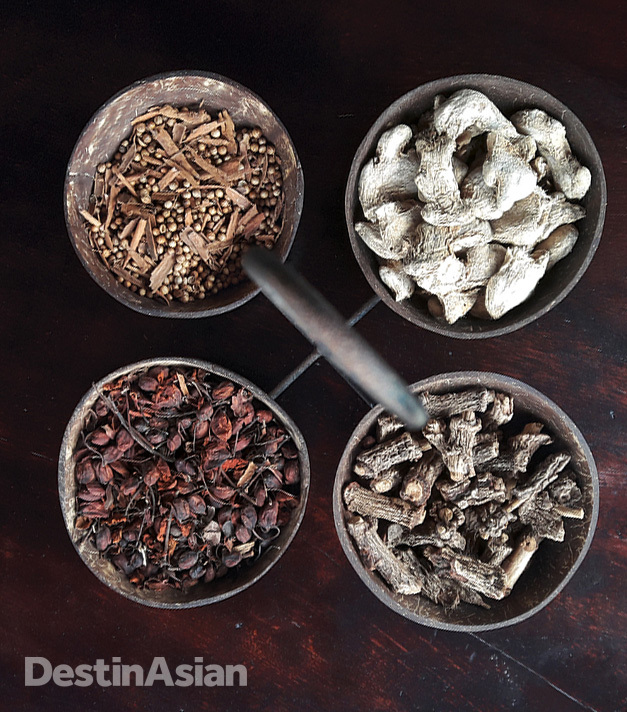 Spices on display in the Anantara Tangalle’s lobby. 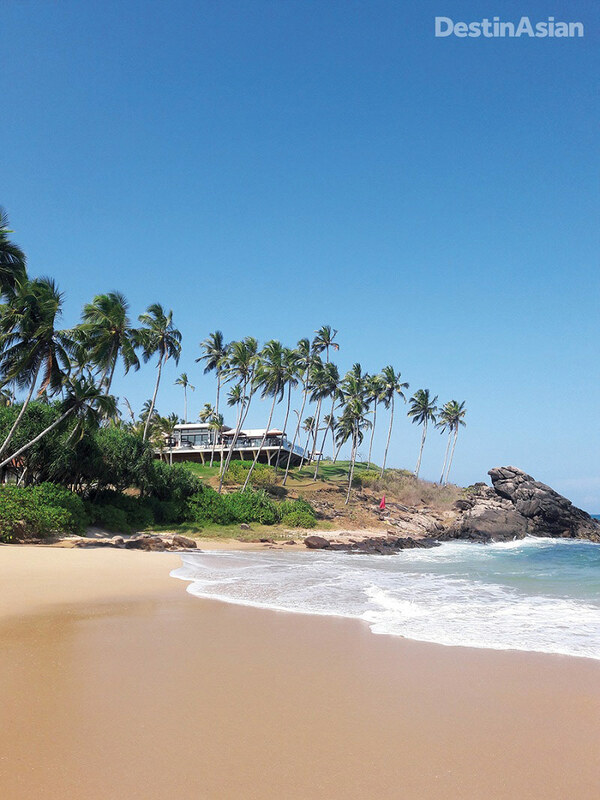 Tangalle, a 90-minute drive east of Galle on the island’s south coast, is blissfully free of the tourist crowds that fill beaches closer to Colombo. But it isn’t exactly terra incognita either. Backpackers and intrepid surfers have long appreciated the area’s laid-back charms, as have the cognoscenti who frequent its handful of luxury villas and boutique hotels like the 30-suite Amanwella, which opened way back in 2005. 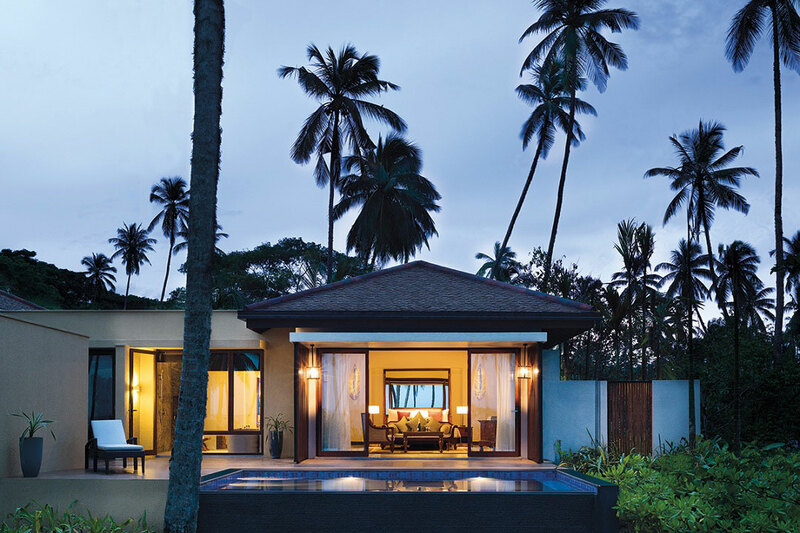 The December debut of the eight-hectare Anantara, however, has put Tangalle firmly on the map. That expressway, the E01, has cut the traveling time between Colombo’s Bandaranaike International Airport and Tangalle from six hours to three and a half. For those who still balk at the idea of spending that much time on the road—even in the comfort of one of the Anantara’s plush SUVs)—Cinnamon Air, an island-wide seaplane service, can fly you to the lagoon at Dickwella in just 45 scenic minutes, from where it’s a short drive to the resort. 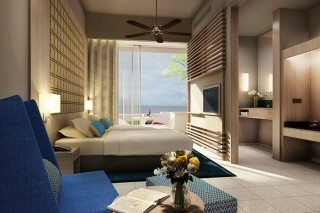 However you get there, the Anantara impresses from the get-go. 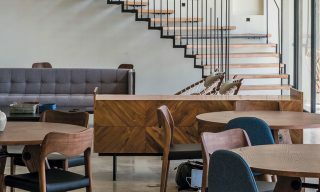 On arrival, guests are greeted by smiling staff under a pillared portico that leads to a lobby designed to evoke a traditional courtyard house, its blue-tiled reflecting pools flanked by whitewashed colonnades. The breezy lounge area behind overlooks the resort’s two-tiered swimming pool and a swath of grassy, palm-studded beachfront, beyond which Indian Ocean waves roll in gently against a sloping stretch of golden sand bookended by rocky protrusions. This view is shared by many of the 152 guest rooms and pool villas, all of which are done up in a pleasant 21st-century colonial style accented by hand-loomed textiles. If, like me, you’re lucky enough to snag one of the beach villas at the western end of the property, you’ll feel like you have the pandanus-edged seafront all to yourself, even if the cove next door is shared with a low-key clutch of cabanas and cottages. I spend most of my down time in my pool, reading or gazing out to sea or watching the ubiquitous chipmunk-sized palm squirrels that dart across the grass from tree to tree, their chirping calls mingling with birdsong and the crash of waves. 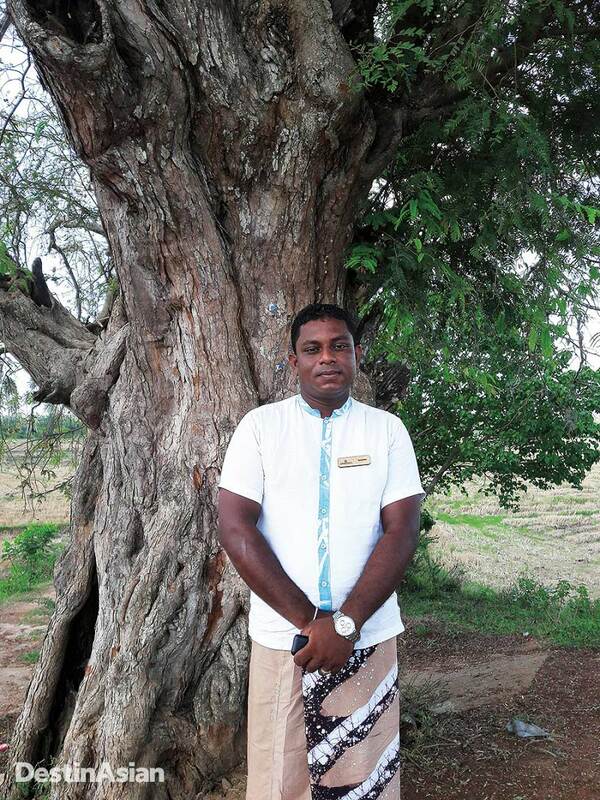 Villa host and experience guru Kanishka Sandaruwan posing in the Tangalle countryside. Villas also come with the services of a butler—or “host,” as they call them here—and mine is Kanishka Sandaruwan, a genial 29-year-old who, like most of the resort staff, hails from the Tangalle area. Kanishka books my treatment at the standalone spa complex and appears at the appointed time to whisk me hence on one of the resort’s cycle rickshaws. He consults on my dining options, which range from Dining by Design—a selection of private, customizable dinners set up on the beach or elsewhere around the property—to meals at Il Mare, the dramatically perched Italian restaurant whose authenticity is underscored not only by a bevy of imported Mediterranean products, but also by a chef and the maître d’ who are both Italian. 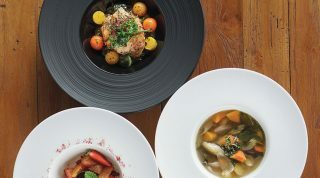 With a recent award from Wine Spectator magazine under its belt, it’s one of the finest restaurants in Sri Lanka. Kanishka also serves as my “experience guru,” advising on local attractions and activities and personally guiding me for a day out in the countryside. There is much to see. Tangalle and its surrounds are an agriculturally rich and diverse area, and our drive takes us past rice paddies, spice gardens, orchards, and even a buffalo paddock where cows are being milked to make curd. We pass Kanishka’s village school and detour along an empty dirt road that traverses a reservoir, halting midway to watch the reflection of clouds move across the water’s still surface. Kanishka tells me it’s one of his favorite spots, and I thank him for sharing it with me. Walking to the base of a giant tamarind tree, he lobs a stick at the branches until one of the pod-like fruits falls to the ground, then peels it open so that I can taste the sweet-sour pulp within. Later, we drop in unannounced on a rope factory, where chugging machines spin coconut fiber into thick, bristling lengths. It’s hardly your standard tourist attraction, but then, that’s the point. Twenty kilometers north of town, the rock temple of Mulkirigala is the area’s headline attraction, though I have the great granite monolith almost to myself. Little wonder, I think, as I haul myself huffing and puffing up the 500-plus steps to the temple’s intricately frescoed grottos and stupa-crowned summit. Still, the view from the top is reward enough, a vast panorama that stretches across green plains and forested hills all the way back to the coast. Il Mare, the resort’s Italian restaurant, sits on a rocky outcrop above the beach. I rise early on my last morning for the drive to the Kalametiya Bird Sanctuary, an expanse of brackish lagoons and mangrove swamps navigable only by canoe or simple pontoon boat. 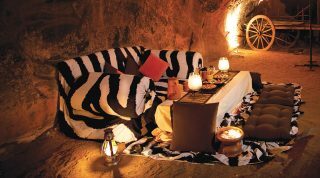 I’m escorted into one of the latter by an Anantara staffer, who comes equipped with binoculars and a well-stocked picnic basket. 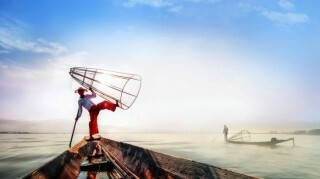 The sun is still low and orange on the horizon when the boatman pushes his pole against the bank of the lagoon and slides us into the still waters. Over the course of the next two hours, we spot all sorts of birds—egrets, ibises, herons, kingfishers—and hear the calls of many more. In one reed-fringed channel, we drift past a group of wallowing buffalo; in another, gray langur monkeys stare back at us from the branches of a gnarled tree. Except for the occasional bird cry and the low rumble of the surf beyond the lagoon’s sandbar, all is quiet and serene. It’s every bit the peaceful haven as the resort up the road. A three-and-a-half hour drive from Colombo, Anantara Peace Haven Tangalle Resort (94-47/767-0700; doubles from US$252) is also accessible via seaplane with Cinnamon Air, which operates a daily flight to nearby Dickwella. This article originally appeared in the August/September print issue of DestinAsian magazine (“Time for Tangalle”). At this greenery-draped hotel, dining experiences connect guests with the soil and local culture.